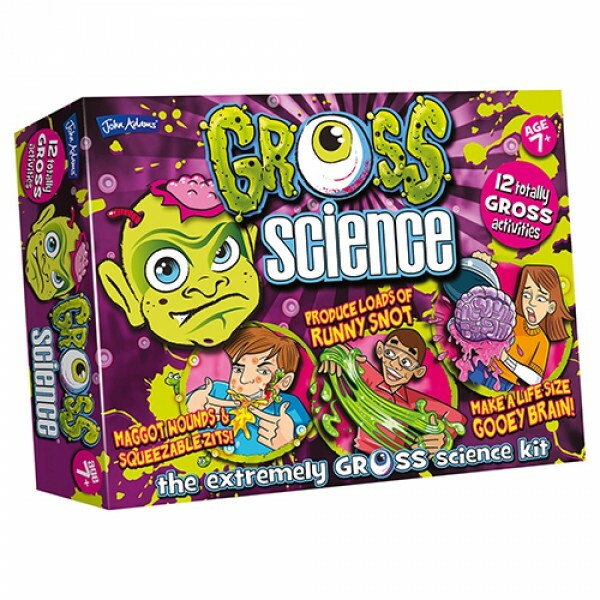 The extremely Grosss Science set with 12 horrid, yukky activities that will teach you about such things as: how farts brew and see a burp in action. What poo is made from and how one is formed. How you can make a life-size bouncy eyeball and wobbly brain. Be warned it could get pretty Gross. The Gross Science contains: Safety Goggles, Fart putty powder, boil sheet, Syringe, Cotton bud, Fake maggots, Stomach model, Wooden Stick, Plastic Cups x2, Poo mould, Scoop, Snot powder, Fart/burp canister and lid. Sponge, Vomit Glue, Wax paper, Eyeball mould x2, Eyeball powder x 2, Colours, Iris Ball, Brain/Finger Moulds x2, Red, Yellow and Green Powdered Colouring and an Instructions leaflet.